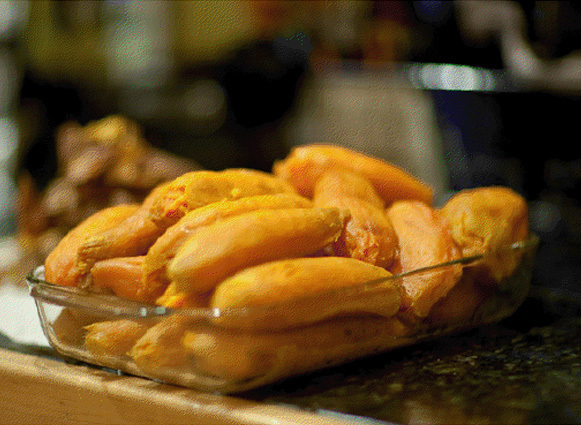 Home / Blog / Lifestyle / Sweet Potato (Yam) Goodness! 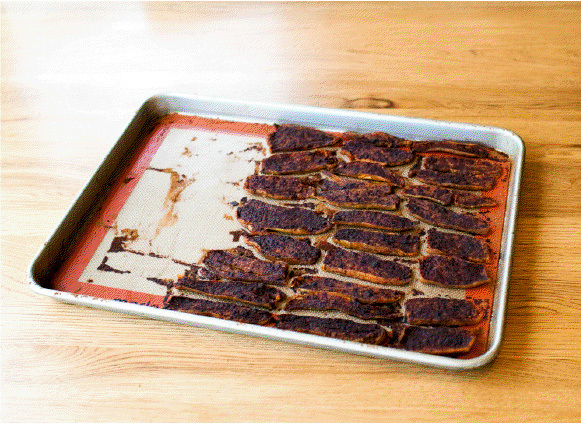 Fantastic sweet potato snacks – Sadly I cannot take credit for these; they are courtesy of the Whole9 website and the Whole30 program and are a recipe I took directly from there. I must give credit where credit is due, and these deserve the shout-out!! I do make some killer ‘proprietary’ yam chips…I will include those on here soon! Sweet potatoes. I thought these were yams, but apparently they are sweet potatoes. Whatever, I don’t really care. Just get the orange ones. The yellow ones don’t survive being baked and cooked. Cinnamon. I’ve read that it improves insulin sensitivity. It’s also delicious. Coconut oil. It imparts a subtle coconut taste that rounds out the flavor of the sweet potato in a truly marvelous way. First, you have to bake the sweet potatoes, so preheat oven to 325. Spread a piece of aluminum foil on a middle rack and bake as many as you can fit for about an hour. You want them soft, so the skins easily pull away from the sides. After baking, let them cool in the oven until it’s convenient to move on to the next step. Sitting in the oven overnight is fine, in fact. Now you have to peel them. If you baked them long enough, you should be able to get most of the peel off with your fingers. Use a knife for any stubborn bits. Next, you need to slice them and arrange them on a baking sheet. You can use a pan liner (like Silpat) to make removal of the finished product easier. Cut them about 1/2 a centimeter thick. You want a uniform thickness if possible, and I find 1/2 cm gives me enough potato to keep it from becoming a mess when I transfer pieces to the pan. Arrange them flat side up. Now, melt your coconut oil and paint on your potato slices using a pastry brush. Give a healthy dusting of cinnamon (I really load up). Then back to the oven it goes for the “drying”. Cooking at 350 for 50 minutes brings about half the pan to an acceptable level. They sizzle nicely under the high heat. Usually, I’ll remove the done ones and throw the pan back in for another 10 minutes and that produces pretty good results. I’ve also done 300 degrees and 90 minutes. That works pretty well too and is more forgiving, meaning less crispy pieces. You may have to experiment a bit. If you go too long or too hot, you will have sweet potato crisps. Not bad, but I prefer the chewy consistency of soft dried fruit. Partition slices into perfect transportable snack-size portions and pack them in Ziploc bags or covered glass storage containers. (I don’t know how long they keep because we’ve never had a batch last longer than a couple days.) Enjoy!